Olympic Champion Eric Lamaze of Schomberg, ON, will open his spring show season on Friday, April 24, in Antwerp, Belgium. The 2008 Olympic gold medalist will compete in four major show jumping competitions in Europe before returning to Canada to contest the summer tournaments at Spruce Meadows in Calgary, AB, running June 10 to July 5. The European competitions on Lamaze’s show schedule include CSI4* Antwerpen, Belgium, from April 23-26; CSIO4* Lummen, Belgium, from April 30-May 3; CSIO5* La Baule, France, from May 14-17; and CSI5* Madrid, Spain, from May 21-24. 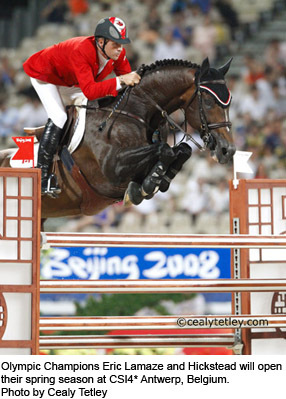 Lamaze will compete with his Olympic mount, the superstar stallion Hickstead, as well as four other top horses in Europe before relocating to Calgary. Hickstead, offered for the first time to North American breeders following his Olympic victory, helped Canada win the Nations’ Cup team competition on February 27 in Wellington, Florida, before taking a break from competition to attend to his breeding duties. Lamaze also won the $30,000 WEF Challenge Cup Round III riding Narcotique de Muze II as well as the $30,000 WEF Challenge Cup Round V riding Take Off during the 12-week Winter Equestrian Festival. In addition to Hickstead, Lamaze will compete in Europe with the horses Take Off, Undercontract, Lord du Janlie, and Ultra Boy.